Home / Urology / Hydrocele or cancer? I would like to share with you this interesting case report: A 24 year old male patient came to me with a rt sided testicular swelling. He was very pale and according to his brother, has recently lost weight. Examination revealed, a large (4″X4″), hard non tender lump. It was obviously solid. I could not feel the testes separately. Lt sided testes was normal with a small vaginal hydrocele. There was no palpable LNs in any region. Patient mentioned that he is having this swelling for last 24 years. Hb was 50%. LFT were normal. Chest X-ray was normal. USG didnot reveal the presence of any enlarged abdominal LNs.USG of the affected testes reported a solid swelling with variable tissue consistency. AFT level was 2.2 (normal <1). I was confused, history said it was hydrocele, everything else pointed towards a testicular tumour. I discussed this with the patient who agreed for exploration with possible orchidectomy. I explored via the inguinal approach, soft clamped the spermatic cord and brought out the testes. It now looked more like a cancer (teratoma). I cut through the testes after packiing the surrounding tissue. Surprise! It was a thick walled (approx 1.5″) cyst containg a fluid like thick soup, the testes was reduced to small olive embedded in the post wall. I then procceded with the orchidectomy. Pt had an uneventful recovery. Any comments ? I was a little unclear about the age of the patient – you say he was 24, but had the swelling for 24 years. Does this mean he had it from birth or was he older than the stated 24yrs. We have seen this sort of picture quite often in patients 40 plus probably the product of generations of doctors aspirating the hydrocoele, causing some bleeding, hence the soup, and inflammation, hence the thick wall. I suppose it could also be the problem in younger patients – had anyone stuck a needle in it before? In my opinion, you managed the case well. What was the final path? 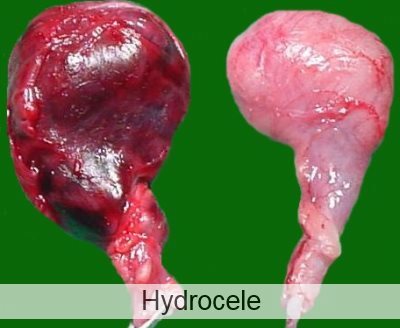 Here is the final histopathology report on the hydrocele sac: infected hydrocele with atrophied testes.